Wed, 15 Aug 2012 | Published in I Was There . 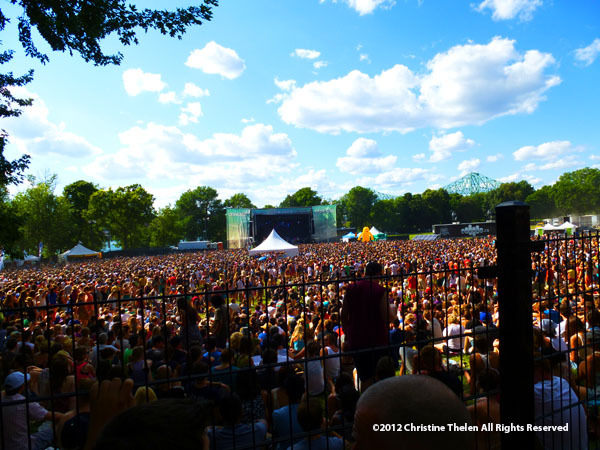 . .
[slideshow id=5]Osheaga (the correct pronunciation of which remains unclear), the 7th annual music and arts festival held in Montreal’s beautiful Parc Jean-Drapeau (St. Helen’s Island), took place from August 3-5. 120,000 Music lovers from near and far welcomed the hot sun, saw through the dustclouds, and danced in the rain and mud puddles to indulge in one of their truest passions: music. For the fist time ever, the festival hosted a sellout crowd and an expansion of the site, itself, as well as the number of stages (5 total). The band list was comprised of many of the same alternative and pop rock artists performing at Lollapalooza, as well as a plethora of special homegrown talent. Definite glows about the festival, apart from the music itself, included lots of fun free stuff to keep everyone’s spirits up: Franks salsa with chips, tiny Coca-cola bottles, a Twister game that got impossibly twisted fast, painting opportunities, spontaneous fireworks, the random bench or plot of fake sod to take a rest, and the blue/pink/green lights that glorified the natural beauty around (water, grass, trees). A big grow for the festival would be to make shorter/easier those very long and tiring walks to and from stages by introducing more shortcuts, a shuttle, and other options of paths to take. These Icelandic folks have been glowing since late 2011, when they signed to Universal Records. 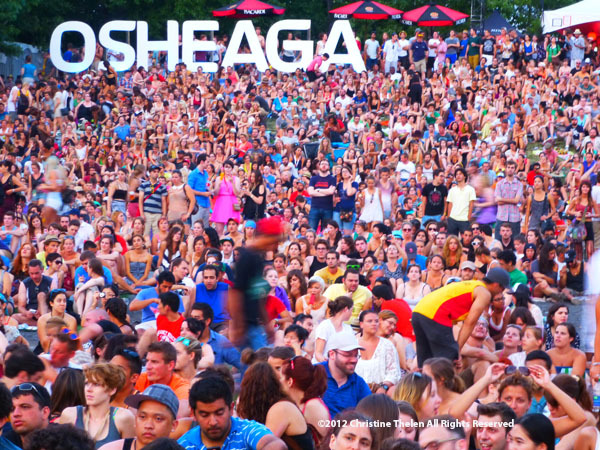 Osheaga, did you really think about this? It was clear that the band had been scheduled to play on a stage with too small an area for all of those people who showed up to watch them. Although there was less creative banter between songs than at other Of Monsters and Men performances, their folk pop still sounded magical and impeccably perfect… even from very far away. “He” is Abel Tesfaye, and he is from Toronto. Seeing him in Canada is superior to anywhere else because of the way the strong fan base boosts up his energy to make him as spontaneous and saucy as many of his lyrics are. 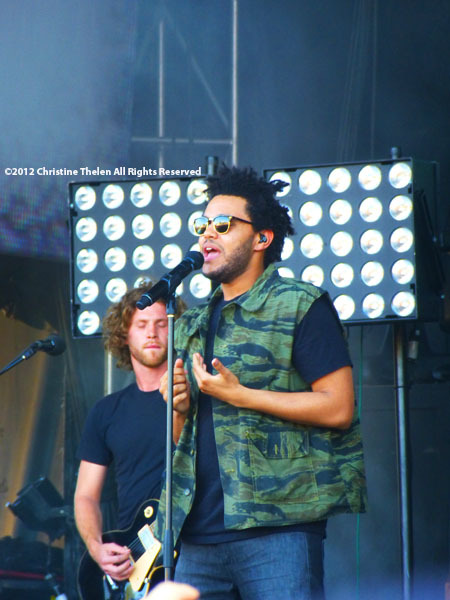 As he, himself, excitedly exclaimed, “It’s good to be back in this mother ______ city!” Compared to shows like the one at Coachella 2012, where it was believed that the sound system did not do his music justice, Tesfaye and his band sounded more alive at this show. Particular favorite songs that sounded solid live included “High for This” and “The Morning.” Songs off the album Thursday were weaved into other songs and not played to completion. One of the last songs, “Wicked Games,” was beautifully sung and accompanied by just one guitar. Surprise, surprise. A second Icelandic band makes the top ten. Apparently, it doesn’t matter if you’ve seen this band very recently; the experience of seeing Sigur Ros live is at once moving and relaxing all the time, every time. Props go to the beautiful camerawork during their set, which didn’t reveal band members’ faces but displayed their instrumentation in mysterious ways. All the bugs buzzing around them onstage looked like orchestrated electronic fireflies. 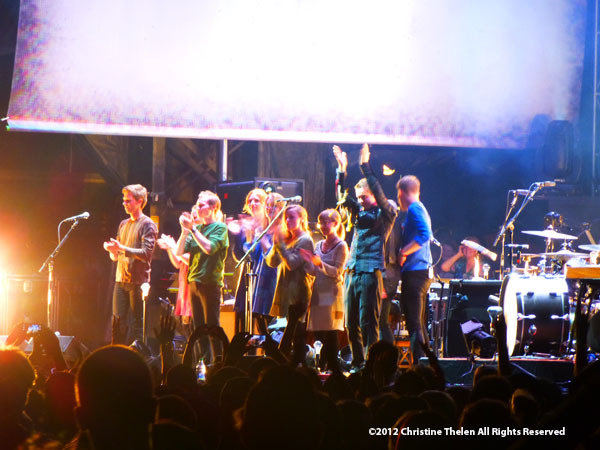 The quiet audience shushed the drunk people as Jonsi delicately slid his bow across the guitar. He finished the set with arms raised high, applauding and cheering enthusiastically. Clearly, this duo shocked everyone and everything. They played on the adjoining stage after the Sigur Ros set. Their set was solid and reverberated across two stages, waking everyone up from the meditative trance that Sigur Ros had put everyone in. The music carried straight to the back of the audience, about 400 meters away. The tricky duo fooled everyone when they pretended to end their set ten minutes earlier than the schedule indicated, only to come back two minutes later with a strong finish as many people were walking towards other stages. This band (pronounced in the way we pronounce a deer, a female deer) was one of those great finds that people gravitate over to at music festivals. Hailing from France and Finland, the Dø’s animated indie pop with a touch of psych was just what everyone needed as people started to arrive at Osheaga that hot afternoon. The clever instrumentation included wrenches hung like wind chimes, a xylophone, and metal plates functioning as percussive instruments. These instruments, along with mechanical drums, created a kaleidoscope of sounds that were on the softer, subdued side at one point and harder and more abrasive the next. Greatest part of the festival, hands down, was when the very saucy and beautiful Shirley Manson came onto the stage with the energy everyone hoped she still had. The band played many lovely songs many had not heard in years, including “Queer,” “#1 Crush” (Romeo and Juliet soundtrack), “Stupid Girl,” “Push It,” and “Cherry Lips.” At almost 46 years old, Manson athletically danced around the stage like that much time hadn’t really passed since we’d heard from this band. They also played some newer songs off the record Not Your Kind of People, which had that energy and punch that made the set cohesive. One of the best performances of all was the song “I’m Only Happy When it Rains,” which began slowly and kicked into gear. To Manson’s delight, the song was very effective, and it poured the next day.